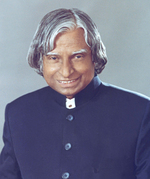 Dr APJ Abdul Kalam, the 11th President of India, who was in Office from 25 July 2002 to 25 July 2007 died while doing what he loved best, teaching students � he was giving a lecture on 'Liveable Planet Earth' at the Indian Institute of Management at Shillong when he collapsed suffering a massive cardiac arrest. He was transferred to Bethany Hospital, but in spite of great efforts by the doctors he was declared dead at 1945 hours (IST). He was a Scientist who reluctantly came into Politics to become India's 11th President. He was behind India's Space program and was lovingly called 'The Missile Man of India', for his great work on the development of 'Ballistic Missile' and 'Launch Vehicle' technology. National mourning for seven days has been declared to pay homage to our 'Missile Man'! He was honoured with the highest honour, the 'Bharat Ratna' and many many more. He was also awarded around 40 Doctorates, including many International Universities! He also played a pivotal role in India's 'Pokhran-II Nuclear Test in 1998. 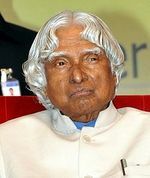 He worked in Trivandrum at the Indian Space Research Organization (ISRO) for 20 years and people of Kerala have a special place in their hearts for Dr APJ Abdul Kalam. He was in Kerala in 2014 to give a lecture at the Book Fair in Trivandrum and the audience took to every word from the great man! The 'Guruvaayurappan Hotel' in Trivandrum was Dr Kalam's favourite place and he always had food from there whenever he was in Trivandrum! And I remember the words of a close friend of mine who worked with him at the ISRO in Trivandrum in the 70s, who only had great things to say about him! Dr Kalam was many things, a Scientist, Aeronautical Engineer, Pivotal power behind India's space program, writer of many books including 'India 2020' and a lecturer, to name a few. He, along with a cardiologist Dr Soma Raju, developed a low cost 'Coronary Stent' called 'Kalam-Raju Stent' in 1998 and went on to develop a 'Tablet' for rural areas, which was named 'Kalam-Raju Tablet' in 2012!! He loved to teach students and it is quite fitting that he died while doing that! He was loved by all who met him and all those who came to know of him, as he was a remarkable person who commanded respect and love. I pay tribute to the great man and he will always be missed for eternity! Following his advice would be the best way to pay homage to the great man! May his gentle soul Rest in Peace with our love and prayers, and the gentle breeze of the Pippala leaves -- 'Bharat Ratna' award is in the shape of the Pippala leaf (Ficus religiosa /Ashwatha /Arayaal/Sacred Fig tree/Bodhi tree)! (Ficus religiosa /Ashwatha /Arayaal/Sacred Fig tree)!